Palladium Pro is a fake security software which also goes by the name Palladium Antivirus. This software was intentionally created to invade a computer through various security holes. Some people get infected by clicking on tricky pop-up's, others try to install some kind of untrustworthy video codec. Some even get e-mails from what seems to be a courier company, but the message includes a document which is infected with a trojan. After the injection of Trojan, Palladium Pro will be injected and all the warning messages will break in. 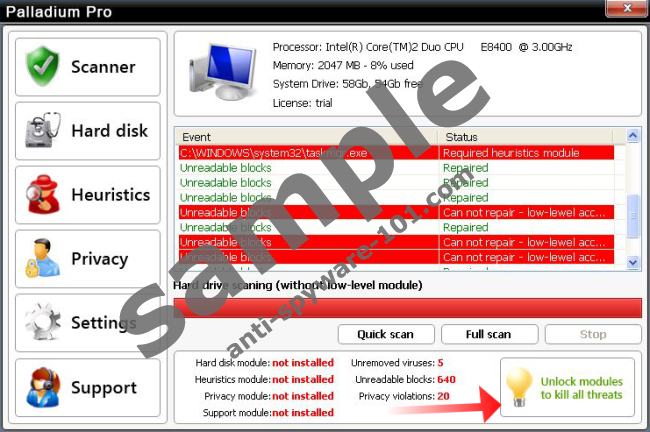 Palladium Pro will also run a fake system scan and generate a report where many safe files will be marked as infected. Furthermore, the trojan that is part of Palladium Pro infection will block all popular security programs. All this is done to make a situation, where Palladium Pro will seem like the only way and that this software will fix all the problems. Don't be fooled and remember this - Palladium Pro is a fake software and all associated with it is the aggressive marketing that it uses. we seriously advice removing Palladium Pro ASAP. !!! If you cant get away from the Palladium Pro screen, wait until the system scan is complete and press the button at the bottom of the screen "Unlock modules to kill all threats"
A new window will pop-up asking to enter confidential information. DO NOT enter any information, and click the X mark to close the window. You will come back to the Palladium Pro Screen, but now You should be able to close the Palladium Pro program and continue deleting the infection. It says in this website if u want to delete palladium pro u have to enter the code above but where to I enter the code at? Try the button "unlock modules to kill all threats"